Seize the initiative with Pathfinder RPG Ultimate Combat! Within this book, battlefield innovations and the secrets of ancient masters combine, equipping the martial classes of the Pathfinder Roleplaying Game with an arsenal unlike any other. Brand-new classes like the sharp-eyed gunslinger, the elusive ninja, and the honourable samurai rewrite the rules of battle, while new systems for martial arts, gladiatorial combat, called shots, firearms, and more empower any character who dares step into the fray. Choose your weapons wisely, as only the best-armed survive. 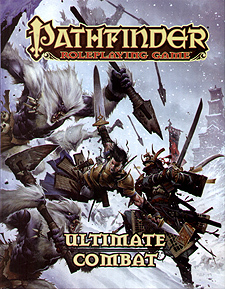 Pathfinder RPG Ultimate Combat is a must-have companion volume to the Pathfinder RPG Core Rulebook. This imaginative tabletop game builds on more than 10 years of system development and an open playtest featuring more than 50,000 gamers to create a cutting-edge RPG experience that brings the all-time best-selling set of fantasy rules into the new millennium. The gunslinger, ninja, and samurai, new classes specially designed to master combat in unique and devastating ways. New player character options for Pathfinder's most combat-focused classes, including barbarian rage powers, magus arcana, martial arts, battle-turning spells, and dozens of new archetypes like the gladiator, spellslinger, and witchhunter. New equipment and combat options for every martial character class, including details on Asian armaments, gladiatorial weapons, guns, siege weapons, and martial duels. A complete system covering vehicle combat, from chariots and carriages to boats and airships. Tons of optional combat rules like called shots, armour as damage reduction, and new ways to track character health. More than 250 new feats, including martial arts feat trees and finishing moves.